The roar in New Delhi’s Indira Gandhi Arena was deafening – India’s Rajender Kumar was taking on Azhar Hussain of Pakistan in the final of the 55kg Greco Roman gold medal. Sport fused with jingoism, in the most primeval of sports, stimulated the massive Indian support base. Olympic medallists Sushil Kumar and Yogeshwar Dutt have been the poster boys of Indian wrestling since the 2008 Beijing Games, when the former won a bronze medal. They carry the burden of a billion hopes on their sturdy shoulders whenever they step on the mat in international competitions. They are young, they are fearless and, above all, they are the understudies of their ustads, Sushil Kumar and Yogeshwar Dutt, who have passed on their technical and tactical knowledge to them. MS Dhoni is a cool guy, not an excitable celebrator. He prefers to stay away from the spotlight but there are rare occasions when he feels the need to express his opinion. As the James Anderson-Ravindra Jadeja controversy became the focus of discussion before the second Test here at Lords, Dhoni decided to voice his opinions. England’s James Anderson catches a ball during a training session; and India’s Ravindra Jadeja holds his face as he waits for a team photograph to be taken at Lord’s in London on Wednesday. India and England gear up for the second Test at Lord’s where a lively wicket is expected to welcome the two teams here tomorrow. Two days ahead of the match, the centre-wicket at Lord’s bore a distinctive green tinge. 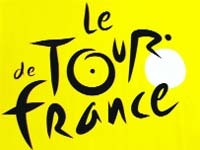 Two days after wearing the yellow jersey, France's Tony Gallopin claimed the 11th stage of the Tour de France thanks to late attacks in a nervous finale on Wednesday. 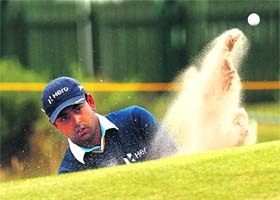 Buoyed by the experience of playing his final practice round with two-time Major champion, Germany's Martin Kaymer, Anirban Lahiri is all ready to fight it out at the British Open Championship, starting at the Royal Liverpool here tomorrow. The roar in New Delhi’s Indira Gandhi Arena was deafening – India’s Rajender Kumar was taking on Azhar Hussain of Pakistan in the final of the 55kg Greco Roman gold medal. Sport fused with jingoism, in the most primeval of sports, stimulated the massive Indian support base. Rajender, then 24, was confident, dominant, despite a nose injury in the second round. He got the gold. The crowd went crazy. Commonwealth Games have always been a happy hunting ground for the Indian wrestlers – we’ve won a staggering 84 medals from the quadrennial event since first participating in 1934. In CWG 2010 in New Delhi, India topped the medal charts with 10 gold, 5 silver and 4 bronze. 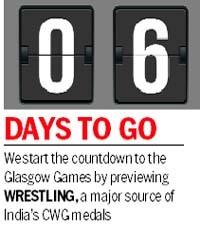 Indian wrestlers hope to set Glasgow’s SECC Precinct Arena afire, too; however, their medal tally will won’t match the 2010 count because Greco Roman wrestling has been dropped from the event. The good news first. 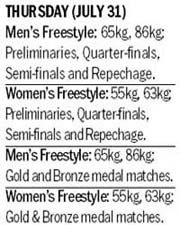 All 14 wrestlers – seven men, seven women – fielded by India have realistic chances of coming back with a medal. However, there are two men who the fans expect to win nothing less than gold – India’s superstars Yogeshwar Dutt (65kg) and Sushil Kumar (74kg). Amit Kumar Dahiya (57kg) has risen to the senior level in spectacular fashion – his historic World Cup silver medal last year proved that the 19-year-old is ready to dazzle at the biggest stage. Bajrang (61kg), also participating in his first CWG, is another bright prospect. Pavan Rana (86kg), Satyavrat (97kg) are also the CWG debutants; they’ve graduated to the senior level after some impressive performances at the junior level and the Commonwealth Championships. Rajeev Tomar (125kg), from Baghpat in Uttar Pradesh, is a veteran, though – he represented India in the 120kg category at the Beijing Olympics too. He was also a part of the squad for Delhi CWG, but a doping offence just before the Games saw him being dropped. In the women's category, Babita Kumari (55kg) and Geetika Jakhar (63kg) are capable of winning gold. Geetika won the silver in the 63kg category in the Doha Asian Games in 2006, while Babita won a silver medal in the 51 kg category at the 2010 CWG, followed two years later by a bronze in the World Wrestling Championships. 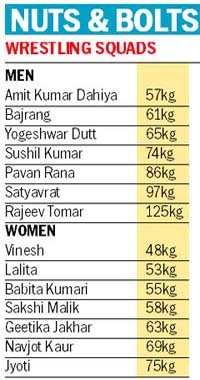 Most of the wrestlers, including Sushil and Yogeshwar, will be competing in a new weight category for the first time in a major international competition. Sushil and Yogeshwar, who were competing in 66kg and 60kg categories earlier, now move to the 74kg and 65kg categories, respectively. 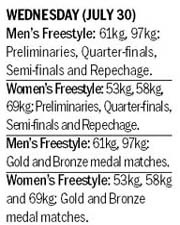 The dropping of the Greco Roman category (in which India won 4 gold, 1 silver and 2 bronze in the Delhi CWG), has hit the Indian grapplers hard. "We are clearly losing seven medals this time. This is unfair on the part of the organisers," said chief coach Vinod Kumar. "Sushil has struggled every time he had to reduce his weight to compete in the 66kg. It would be difficult for him to change his weight category to 74kg. Same for Yogeshwar, who has to gain 5kg. The decision will not only affect Indian wrestling but other countries as well," added Kumar. There was unsavoury drama in a controversy-marred build-up to the Games when Amit Kumar Dhankar moved Delhi High Court, accusing the Wrestling Federation of India (WFI) of short-listing the wrestlers for Glasgow CWG without holding trials. However, the court refused to tinker with the list of selected wrestlers for CWG. “There have been instances in the past when the WFI selected the team without holding trials. This time too we selected the team based on our wrestlers' past performances,” said Kumar. Olympic medallists Sushil Kumar and Yogeshwar Dutt have been the poster boys of Indian wrestling since the 2008 Beijing Games, when the former won a bronze medal. They carry the burden of a billion hopes on their sturdy shoulders whenever they step on the mat in international competitions. This time too, the burden of expectation once again will be on them to deliver. A bronze in the Beijing Olympics might have come as a surprise but Sushil's historic silver in London proved that it was not a fluke. Taking a cue from his long-time friend's achievement, Yogeshwar forgot about his painful exit from the Beijing Games and went on to grab a bronze in London Olympics. Since then, a prolonged injury lay-off put them out of the arena for the better part of 2013, including the World Cup and Asian Championships. They’ll be competing in new weight categories, and both warmed up for Glasgow by winning medals at the two-day international tournament in Italy. Yogeshwar clinched his first gold in his new weight category, while Sushil won a silver. "We are confident of getting five-six gold medals from the Games. We know people expect me and Sushil to deliver, but there are other young wrestlers in the team who can also win gold medals, too," said Yogeshwar. "Me and Sushil returned to the ring after almost two years and won medals in Italy. I defeated the 2011 world champion in the semifinal. This shows that we are ready," added Yogeshwar. This time, Sushil wants to win all seven medals on offer. "It's disappointing that Greco-Roman category is not there. So I want the freestyle wrestlers to step up and compensate for the loss," said Sushil. For Sushil and Yogeshwar, apart from getting home the gold from the CWG, there would be an additional responsibility of guiding a relatively young side to the podium finish. "We know, as seniors, we have a dual role to perform. For Amit, Bajrang, Satyavrat and Pavan Kumar, this is their first CWG. They are feeling the pressure but our job is to keep them calm. We have to act as their mentors too,” said Sushil. Meet the world Cup silver medallist Amit Kumar, World Cup bronze medallist Bajrang, 9th Roustam-E-International title holder Satyavrat and Commonwealth Championships gold medallist Pawan Kumar, all first-timers at the CWG. These young wrestlers want to carry on the torch from their "idols". Sweat and blood shed during training has made them determined to put up an impressive show in Glasgow. "This is my first CWG and I am only looking at bringing the gold medal in my 61kg event," said Bajrang, who has been mentored by Yogeshwar. Bajrang, who comes from a low-income background, couldn't thank his "guru" Yogeshwar enough for taking care of his training needs and mentoring him to podium finish in the World Cup. "Yogeshwar bhai has played a big role in grooming me. Whatever I am today is because of him. It was always my dream to compete alongside him and now I have got the opportunity to be part of the team which has Sushil and Yogeshwar bhai," added Bajrang. Ditto for Amit Kumar. 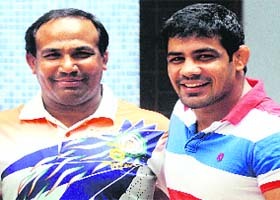 Sushil has been a guiding light for Amit since 2012, when the diminutive grappler became the Asian Junior gold medallist. Amit's attacking ways and tactical acumen led to his promotion to the senior team. The Nahri resident instantly made an impact and became the youngest Indian wrestler in the team at the London Olympics. His moment of glory came in 2013 when he brought home the historic silver from the World Cup in Budapest. "The presence of Sushil and Yogeshwar bhai in the team will inspire us to give our 100 per cent. They have played a big role in guiding us," said Amit. Satyavrat, who made his debut with the senior team last year, said he always dreamt of representing the country at the CWG. "I am the youngest member in this group and it feels great to be part of the team. This is a dream come true for me,” he said. New Delhi: The postponement of elections by the Boxing India has infuriated the International Amateur Boxing Association (AIBA) so much so that it has barred the Indian coaches from occupying ringside seats during bouts at the Glasgow CWG.In a communication sent to Boxing India and the Indian Olympic Association (IOA), AIBA has made it clear that Indian coaches, including Gurbax Singh Sandhu, will not be allowed to occupy ringside seats and, instead, AIBA officials will attend to Indian boxers during bouts. IOA president N Ramachandran has already shot off a letter to the Commonwealth Games Federation (CGF) to look into the matter. AIBA's tough stand was in response to Boxing India postponing its July 9 elections indefinitely after completing formalities pertaining to filing of nomination papers. IOA has expressed surprise at the latest development, saying it wasn't expecting such a move from AIBA after the world body allowed the Indian boxers to participate under the national flag at the Games. The boxers have been participating in international competitions under the AIBA flag ever since the suspension of the Indian Amateur Boxing Federation (IABF) in December 2012. "We were not expecting this from AIBA. Our president has already written a letter to the CGF apprising them of the development. We are confident that the matter will be resolved in the coming days before the boxing competition begins," IOA secretary and boxing ad-hoc committee member Rakesh Gupta told The Tribune. New Delhi: As the Indian contingent departs in batches for the Glasgow Commonwealth Games, the country's top sports institute in Patiala has drawn severe flak from athletes and coaches for the "unacceptable conditions" they have had to live and train in. Ace paddler Sharath Kamal, who has brought laurels to the country by winning three gold medals at the CWG, called the living conditions at the National Institute of Sports "unhygienic and unacceptable" for any athlete representing India. "Playing conditions are okay but staying in NIS is a nightmare. I don't have to be in Patiala for long as I am in Germany for major part of the year but I feel bad for the other athletes who live here for a long time," Kamal said today before leaving for Glasgow. Sharath paints an unpleasant picture of the accommodation and other facilities at NIS, founded in 1961. "The rooms are in a bad shape, the common bathrooms are full of filth and the air conditioners in the rooms are hardly effective in this heat. We are not asking for something fancy but we need basic facilities before you expect us to be the best in our sport," said the world No.44. A foreign coach stationed at India's sports hub, requesting anonymity, said "if NIS is seen as country's top sports institute then god save Indian sport." SS Roy, regional director at NIS, admitted that part of the athletes' accommodation was old and needed renovation. A new hostel block in the campus is expected to be functional by the first week of August, said Roy. Women’s boxing and the mixed team relay event in triathlon will make their Commonwealth Games debuts at Glasgow 2014. The Glasgow Games will have the largest ever number of fully integrated para-sport events, with 22 medals up for grabs in five sports. Canada has been the dominant nation in the wrestling history of the Commonwealth Games. 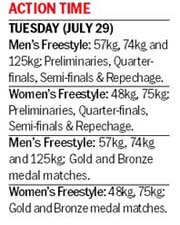 The Indian wrestling team is confident of bagging at least 10-12 medals at the Glasgow Games but Canada, in particular, England and Nigeria will give them a run for their money. Chief coach Vinod Kumar said these nations would pose India serious questions. As the captain received a constant barrage of questions on the altercation between Anderson and Jadeja, his tone and message summed up the gravity of the incident. It still remains unclear where the episode took place. Anderson and Jadeja were seen mouthing off to each other as they left the field of play at lunch on Day 2 of the first Test at Nottingham. It is believed the staircase that leads up to the dressing room is narrow and this is where the tension seems to have boiled over. The Indians then reported that Anderson had pushed Jadeja. Dhoni, the batsman to accompany Jadeja at that time, was in front as the pair left the field. But with the English team walking off at the same time, it remains a mystery how the incident could have been missed by the other players. A view is that the altercation took place at the end of the second day’s play. It was while the players left the dressing room, Anderson still fuming from an argument earlier in the day, that he allegedly shoved Jadeja, and only two Indian players, Gautam Gambhir and Ravichandran Ashwin were witness to the incident. England captain Alastair Cook stated during an interview with BBC that he knew nothing of the incident until Monday. The English captain also stated the Indian team was blowing up the incident and even accused the Indians of trying to unsettle the bowler. England team manager Phil Neale has charged India’s Ravindra Jadeja under Level 2 of the ICC Code of Conduct for an alleged incident that took place on the second day of the first cricket Test, an ICC release stated, the ICC today confirmed. Much of it is expected to disappear by the time of the toss on the first morning. Even so, it is possible that the wicket will retain some juice in it, thanks to this delayed shaving. Italian Vincenzo Nibali retained the overall leader's yellow jersey after staying safe by the front of the bunch in the final descent. "It was a great round of golf. He's a nice guy and very down to earth. We spoke a little bit about football and a bit of this and that," said Lahiri.